The Wheelman specializes in the design and manufacture of crimping dies or "wheels" for the wire cloth, wire partition, and wire belting industries. 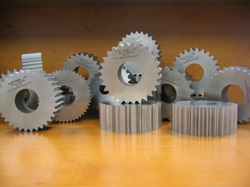 We make hundreds of wheels each year for Jager and other crimping machines. We have over 20 years experience in the wire cloth industry. We can design wheels, make new wheels, make new teeth, or rebuild your old wheels. Check out our services page to review what we can do for you. We can deliver solid wheels in as little as 3 to 4 days. For more information on our rush services, check out our Expediting Page. We use some of the most advanced CNC Technology in the manufacturing process; this ensures repeatability of the parts we make. We inspect EVERY TOOTH on the wheels we manufacture to insure they meet our strict tolerances and exceed your expectations. Check out our inspection page for more information.